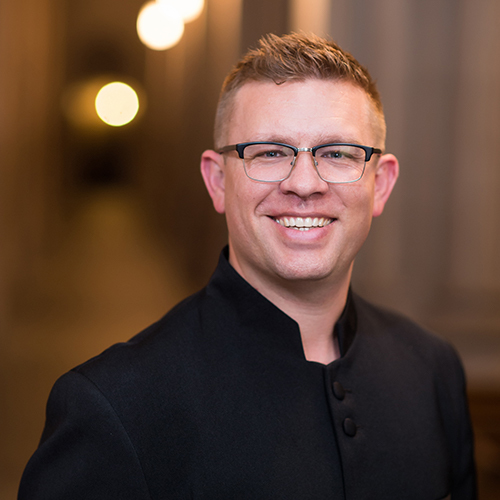 Brian A. Schmidt is Associate Professor of Choral Music at Baylor University and conductor of the Baylor A Cappella Choir and Chamber Singers. He also teaches the graduate choral conducting and literature courses and guides graduate conducting recitals. Schmidt is founder and Artistic Director of the South Dakota Chorale, a professional choir based in Sioux Falls, SD and has grown the ensemble’s artistic presence through commercial recordings and an international recording contract in 2014 with PENTATONE, a Dutch classical label. Previously Schmidt served at Duke University Chapel where he conducted the Duke Vespers Ensemble and founded several new ventures including the monthly Bach Cantata Series and Cappella Baroque (a professional period-instrument orchestra) along with publishing recordings on the MSR Classics label. He is a frequent guest conductor and his choirs have appeared on Division and National ACDA Conferences and Boston Early Music Festival. He was selected by ACDA to represent America in the International Conductor Exchange Program with Sweden, resulting in study and guest conducting opportunities in Sweden during the fall of 2015. Schmidt graduated from the University of North Texas, where he completed MM and DMA degrees under Jerry McCoy and Richard Sparks, along with early music studies under Lyle Nordstrom and Lenora McCroskey.